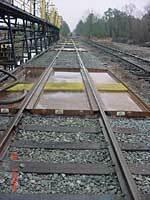 Trans Environmental Systems offers open-track pans with slide-out panels designed for spill containment during loading and unloading of railroad cars. These track pans lagbolt down to existing track ties and retain about 200 gallons of liquid. The design offers an alternative to the rolling lid design. The model CPO fits between the rails and can be complimented by two model SPOs that can be set outboard of the rails to provide a protected area over 12 feet across.